Win $50 Amazon Gift Card and amazing eBooks from participating authors. Enter Today and Share with Friends! The free shorts page for Rubiconwriting has been updated to include a bonus scene and deleted scene from Out of the Ocean and a magazine article, interview with Bryce from Holeshot 2. Seelie has a new release today that we wanted to share with you. stories, some contemporary stories with paranormal twists, and more. SHERRI JORDAN-ASBLE is working hard at finishing Molten Blood and then the 2nd installment of Pepper Chance. Stay tuned all year for updates, guests, giveaways and more! A.D. Ellis has a new release today… His Reluctant Cowboy! Out-and-proud volunteer dance instructor, Reid Alexander, is a California boy accustomed to living in flashy luxury. He is less than thrilled upon inheriting his late grandfather’s South Dakota horse ranch. Yet he must endure three months of cowboy hell before he can even consider selling the property.As the ranch foreman, Walker Corrigan’s entire life is Pine Ridge. When Reid arrives with cold-hearted plans to sell, Walker endeavors to endear the place to the younger man. Reid is unprepared for the sudden attachment to Walker, the land, and – unbelievably enough – the horses. Walker’s long-suffering heart takes an unexpected gallop straight toward Reid. Both men are on-board with exploring their relationship, and Reid discovers ranch ownership is more gratifying than he’d once imagined.But Reid is forced to reconsider his place on the ranch when threats put the property and employees in danger. Menacing events call Reid’s integrity into question, and he considers saving everyone the hassle and throwing in the reins. But how can he leave when his heart now feels at home on Pine Ridge Ranch and in Walker’s arms? 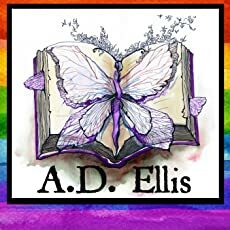 A.D. Ellis is an Indiana girl, born and raised. She spends much of her time in central Indiana teaching alternative education in the inner city of Indianapolis, being a mom to two amazing school-aged children, and wondering how she and her husband of nearly two decades haven’t driven each other insane yet. A lot of her time is also devoted to phone call avoidance and her hatred of cooking. She loves chocolate, wine, pizza, and naps along with reading and writing romance. These loves don’t leave much time for housework, much to the chagrin of her husband. Who would pick cleaning the house over a nap or a good book? She uses any extra time to increase her fluency in sarcasm. Sign up at http://www.subscribepage.com/ADEllisNewsMMRomance for a FREE male/male romance book. To All the Amazing Authors who participated! We had 19 guests with their amazing Christmas stories this month. I wanted to thank them all for participating. A huge thanks to the readers for checking them out and entering the giveaway. Scroll through and see if you missed any! We had an WHOPPING 397 entries in the giveaway. I’m drawing the winner now…. The Winner is Will Griesmer! I’ll email you today with winning info!